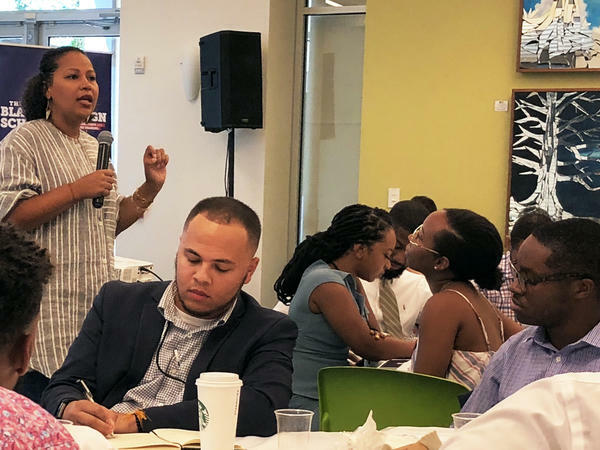 Jessica Byrd, the founder of Three Point Strategies, leads a session on stump speeches at the second annual Black Campaign School in Atlanta, Ga.
Quentin James was tired of the Democratic Party taking black votes for granted without investing in building black political power. So, in 2016, he started the Collective PAC to fund progressive black politicians. The following year, James, a veteran of the Obama campaign, established a boot camp — the Black Campaign School — to train those candidates. "Ninety percent of our elected officials in this country are white, and so part of this is about equal representation," James said on a recent humid Sunday in Atlanta, where he was organizing the second annual Black Campaign School. More than 100 campaign staffers, candidates and potential candidates from New Hampshire to Texas sat around in green plastic chairs at a nonprofit that had turned into a makeshift school for the weekend. They took notes in their campaign manual binders as they listened to experts from the Democratic Senatorial Campaign Committee, Planned Parenthood and Emily's List. The pop-up school was sponsored by the Democratic establishment, but in many ways, it was also defying that very establishment, trying to build black political power where the Democratic Party has not always succeeded. "Unfortunately, a lot of our progressive trainings and Democratic trainings don't center the experience of racism in this country," said James, who insists Democrats of color can't afford to ignore race, particularly now, in the era of President Trump. "He's really inspired a heightened level of white supremacy and white nationalism in our country," James said, referring to Trump. "If we aren't preparing people on how to run in a heightened, almost racist environment, then we're doing them a disservice." And so, James is trying to create a candidate training that recognizes and values the importance of race. It's fundamentally different from the typical campaign class offered to Democratic candidates. The Black Campaign School is not solely focused on gathering the maximum number of electoral wins; it's trying to build black political power, workshop through campaign hiccups, and create a space where campaign staffers and candidates can speak candidly. "How do you balance the old guard trying to influence how you run your race?" one person asked. "What is the maximum loan to yourself to be reimbursed by future fundraising?" another asked. Then one woman in the back asked a question that represents how different this campaign school is from others. "I remember hearing — and this was years ago — as a black woman, you can't change your hair while you're running. So if you had straight hair, don't go back and forth between having straight hair and wearing your hair natural. And I just really wanted to have a conversation about that," she said. "Black women — we change our hair all the time. Why do we have to live any differently because we're running?" she asked. A woman shouted "amen" in agreement. Jessica Byrd, the campaign strategist running this Q&A session, chimed in. "No, that's bull****," she said flatly before adding a more personal plea. "You all, we got to fight respectability. We're never goin' build the thing that we want to build if everybody has to look a carbon copy of each other." Byrd was the main teacher at this weekend's school. She's a progressive campaign strategist who has worked on dozens of races across the country. She pulled up examples of problematic media coverage on a giant projector screen so the class could follow along. "Debt, jail, and government cheese: Stacey Abrams thinks she can turn Georgia blue by getting real," Byrd read aloud to the class. It's a headline about the Democratic nominee for governor in Georgia. "Have you ever heard of a white male candidate being talked about 'government cheese?' " she asked rhetorically to some hushed laughter. Byrd also taught sessions on stump speeches, opposition research tactics and media strategies. But the most pervasive problem among candidates in the room wasn't so much policy as it was money. "I knew fundraising was gonna be difficult, I just didn't know how difficult it was gonna be," said Erica Crawley, an Obama-endorsed Democrat running for a seat in the Ohio Legislature. Crawley won a competitive primary, but she said spending hours calling people asking them for money was much harder than she had thought. "We don't get funding," said Myya Jones, a millennial running for a seat in the Michigan Legislature. "And when you don't get funding, you get discouraged." Jones said people constantly question her ability to run for office. "Not only am I black and I'm female, I'm young," she said. "I'm 23 years old. So, it's like, 'what does this 23-year-old know?' "
But Jones said she tries to stay focused on her main goal, which is not necessarily a victory, but a mission to get more young people involved in the political process. She was the first in her family to go to college after growing up in low-income housing. "It's not up to me make it out and then be out," she said. Many candidates, particularly first-time politicians, spoke about a moral imperative, similar to what Jones described. For some, that imperative is tied specifically to the backlash they're witnessing in the presidency of Donald Trump. "I knew it was not going to be enough for me to just register my family and others to vote, that I needed to do what Barack Obama said: If you don't like what you see, get up, get your clipboard and run for something," said Francys Johnson, the former head of the Georgia NAACP, now the Democratic nominee for Georgia's 12th Congressional District. That district is largely seen as a safe Republican seat. Two years ago, the incumbent won by over 20 percentage points, and Johnson said it's been a challenge to prove to the Democratic establishment that he can win. But James said that's where the Black Campaign School can help; it'll invest in black candidates who might feel overlooked by the establishment.